If you're experiencing red, itchy or painful skin following sun exposure, you may have sun poisoning rash. Sun poisoning is a severe form of a sunburn - and the rash that follows is an allergic reaction, known as photodermatitis. All or some of these sun poisoning rash symptoms may be present, depending on the severity of the rash. Some may look more like a traditional sunburn, while others will have raised bumps. 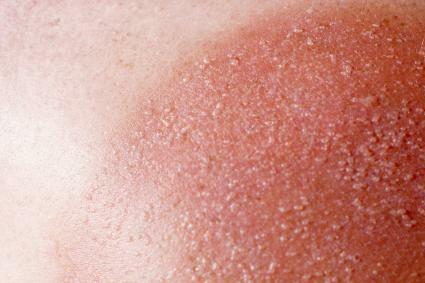 Like sunburn and sun poisoning, the rash is caused by exposure to the sun. It is an allergic reaction to ultraviolet rays - the same ones that cause skin damage when you are outside for an extended period of time. Sun poisoning rash can affect people of all ages and skin types but is often seen on children (especially during the summer months), people with lighter complexions (there is less melanin), and those with sensitive skin. It is important to note that some drugs can heighten skin's sensitivity to UV rays. They may increase the chances of developing a rash after sun exposure. WebMD lists a number of Sun-Sensitizing Drugs, including areamiodarone, nonsteroidal anti-inflammatory drugs, and tetracycline. These medications can make existing skin conditions worse (such as eczema) and cause a rash to occur. In the article, "Sun Allergy: The 4 Most Common Types," blogger of My Sun Allergy blog says that this issue is labelled as photoallergic eruption. 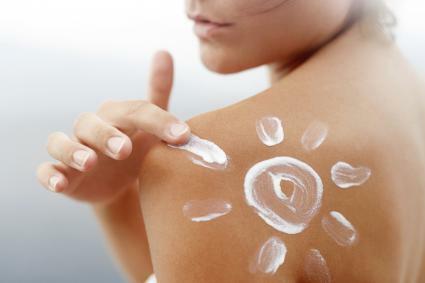 In addition to sun-sensitizing drugs, photoallergic eruption can be caused by the application of products. An ingredient in a cosmetic, fragrance, cream, lotion, or sunscreen lotion, may result in an itchy rash or collection of small blisters once sun exposure has occurred. Take cool showers to lower the body's temperature. This will help stop the rash from coming back. Take baths in baking soda to help soothe the affected areas. Take an over-the-counter pain reliever like Advil or Tylenol to relieve some of the pain and inflammation. Apply a topical anesthetic such as benzocaine. Apply Calamine lotion to patches of itchy skin. Stay out of the sun or wear protective clothing while the rash heals. Depending on your sensitivity levels (and whether you have experienced sun poisoning in the past), the rash may appear between 10 and 30 minutes of unprotected sun exposure. 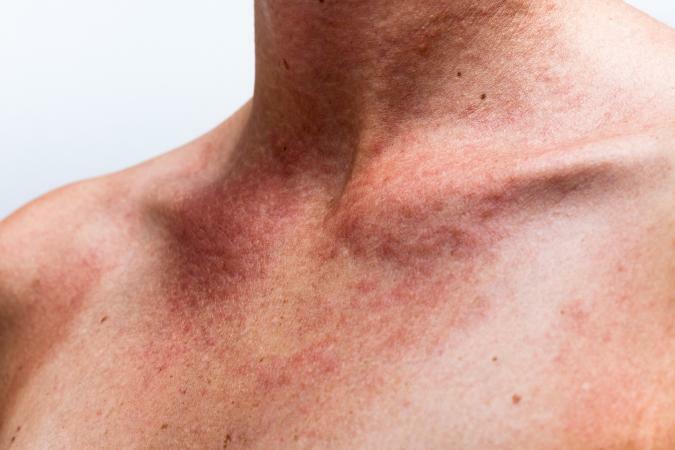 According to New Health Advisor, this reaction can last anywhere from a few hours to three full days, with a severe rash lasting for ten days. If you are not seeing improvement within two weeks, speak to your doctor about other treatment options. The only way to prevent a recurrence of a sun-related rash is to determine what caused it. Common sense prevention, such as avoiding skin-damaging activities like tanning beds, sun bathing, and excessive amounts of time outdoors can reduce your risk. The PopSugar article, "How to Avoid Sun Poisoning," also suggests staying out of the sun (or minimizing exposure) between the hours of 10am and 3pm. Be sure to use lip balms and sun protectants, especially if you have fair skin or have experienced sun poisoning rash in the past. As much of a fashion faux pas as it may be, zinc oxide paste is also an excellent choice for those who need the ultimate in protection. For even more ways to prevent a rash, check out Allure's article, "11 Sun Protection Tips from the Country's Best Dermatologists." Remember, cloudy days can cause as many issues as hot summer ones. According to CNN, up to 80 percent of UV rays can pass through clouds. So, even it if is overcast, you may be putting your skin at risk. Be aware and on guard year round if this sort of irritation is an issue for you. 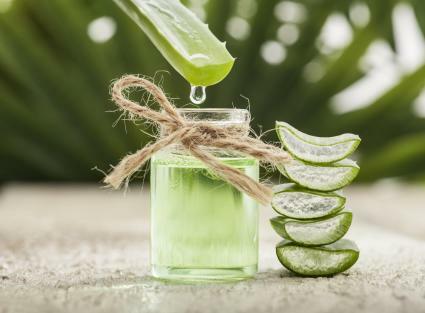 No one wants to deal with red, itchy, irritated skin. Thankfully, there are ways to treat the symptoms of a sun related rash and prevent them from happening again. Just remember to stay sun safe throughout the year.